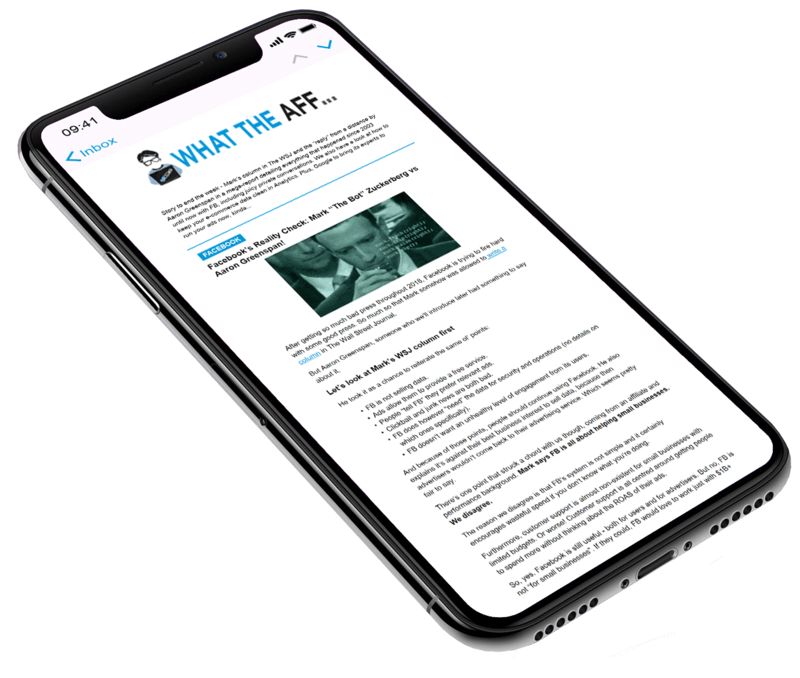 November 28, 2018 - The digital marketer's #1 daily briefing! Lesson learned - don't make the authorities angry. So, don't follow Facebook's example in this case. An engineer at the company dropped the bomb in an email that an MP is now using to get Mark to testify. Cyber Monday won vs Black Friday for online sales. Canada Post is back to work and there's also some big crypto news we thought to share with you. 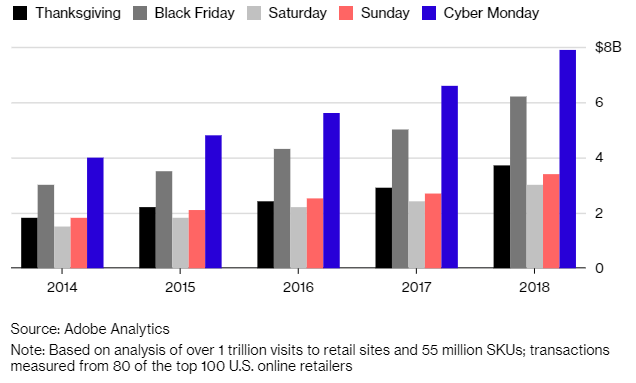 On Monday, we already talked about the BFCM Weekend and that Cyber Monday is expected to be the biggest online shopping day ever, with expected sales of $7.8B. Well, it was slightly bigger, hitting $7.9B in the U.S. And totally surpassing the Black Friday amount grossed. But, among the big numbers, who are the BFCM winners? Who are the losers? Online retailers that managed to keep their website running all the time are the winners. Which was not the case for home-improvement store Loew’s Cos or J. Crew. Even Walmart reported some issues because of higher than expected web traffic. The losers? Brick-and-mortar sales during the four-day period from Thanksgiving to Sunday were down 6.6 percent. A breakdown by device shows that smartphones account for 49 percent of holiday-shopping traffic, but only 30 percent of purchases. It looks like a lot of people get to know about products and deals by browsing on their phones, but end up purchasing on their computers. While it only accounted for 42 percent of all holiday-shopping traffic, 61 percent of purchases were made on desktop. Same growing mobile trends showed on Black Friday. Well, the holiday season isn’t over yet. There are more campaigns to scale! Time to squeeze this final part of 2018! The UK Parliament Member Damian Collins has another arrow to fling at Facebook. But who is Collins? He is the man who called Mark Zuckerberg to testify several times in front of the British Parliament. He is the man behind the discovery of those compromising documents we talked about on November 26th. The documents that prove that Facebook was aware of its data leak by Cambridge Analytica. And among those documents, seized by the Six4Three software firm, he found another hot potato. Or maybe, it’s better to call it “another bomb”. In fact, Collins said he reviewed an email from a Facebook engineer highlighting suspicious Russian-linked data harvesting on Facebook two years before that. Therefore, Facebook was aware of its data leak activities by Russia too. They said that the document cited by Collins was taken out of context. “The engineers who had flagged these initial concerns subsequently looked into this further and found no evidence of any specific Russian activity”. Unfortunately, we don’t know who is right, ’cause those documents are sealed by the Californian court for some bureaucratic reasons. This means that they can’t be published. However, Collins said the committee hoped to publish the documents in the coming week. Hot news coming! Meanwhile, Mark keeps turning down Parliament meetings. And the British Government said that the problem isn’t the data leak. The problem is Facebook itself. And that it needs to be regulated by national governments. Do they want some of that data too? We would like to have some too. But for the moment, we are just grateful with the daily content that Facebook provides us, with their endless troubles. It makes the job easier for the WTAFF Crew. Facebook provides The WTAFF Crew not just with its Government problems. In fact, the company announced that it’s expanding the Watch Party feature to pages and profiles. This feature was previously available only for groups. A Watch Party is a feature that allows many users to watch a video together and comment on it live. Basically, it’s like going to the cinema. But on Facebook. And there are moderators keeping an eye on the comments section. Since it came out of beta in July, the company reports, the number of daily Watch Parties has grown sevenfold and there have been more than 12 million Watch Parties. Moreover, the company is highlighting its new Live Commentating feature through an event on Wednesday: a Big Chicken Shaq Watch Party, hosted by Shaquille O’Neal on his page. A cool initiative by Facebook. Yet, a Watch Party we would die for, is the one hosted by Mark Zuckerberg. A live video while he testifies in front of the Parliament Members. That would be the kind of Watch Party we would definitely attend. Canada Post strike is over… Finally! Canadians who still rely on shipments delivered through Canada Post totally felt the effects of its postal workers across the country, opting for a rotating strike. The heart of the dispute had to do with how its postal workers in urban and rural areas are paid. While urban workers are paid on an hourly basis, their rural counterparts are paid based on the size of the route. Ok, enough background on it. Around noon eastern time, the strike finally came to an end. The efforts to stabilize the operations are now in full swing, however, huge backlogs mean there would still be huge delays in delivery. So, don’t just start shipping there through ePacket just yet. There’s still a way to go before things are completely back to normal. Well, what a time of the year to strike and strike hard! A few days back, we talked about the new ad rolls YouTube is introducing with 2 ads in 1. However, today they also announced the retirement of all annotations on its video streaming platform. These annotations are those boxes that pop up during a video with links and additional textual information. While they first started reducing these annotations in May 2017, they will now be completely discontinued by Jan 15, 2019… for good! Apparently, annotations didn’t work as well as expected on mobile devices. Another reason for this discontinuation is the introduction of YouTube Cards which are visually more appealing than text-based annotations. Some credit also goes to End Screens which allow you to engage your viewers right as your video finishes and encourages them to watch more on their devices. We bet you have seen them all on YouTube several times, you just may not know what they are called. Wanna make more out of your lead gen campaigns? GO DIRECT! Plus a bonus if you visit Affiliate World Asia. Missed our previous mention of Survey Junkie? No worries, we’ll remind everyone about them now. They’re one of the world’s biggest market research panels and they need your affiliate powers! It’s simple. They have a direct offer for a single opt-in email submit thatconverts between 25 and 50%. They’re working with high budgets from Fortune500 companies, so they told us to dare you again to hit the cap! And there’s more! This time they want to add a little present for you. 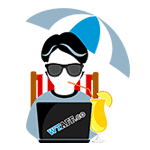 Sign up as a new user with Survey Junkie before December 5th, and mention promo code WTAFF18 in the notes and you’ll receive a 10% match on all revenue generated through the end of the year! They already know media buyers like yourself have the power. Go show ’em what you got! They are also going to be at Affiliate World Asia and will be running a “drop your business card” contest. They’re giving away AirPods, Apple Watch, Beats and other cool gadgets like these. Check them out at booth A26! Talk deeper details about doing business, get to know their team better and maybe you also go home with a new gadget. Sign up and get that juicy ROI! Do you want to meet the people behind what some readers call their mandatory daily read? We mean this newsletter if that wasn’t obvious! Well, we want to meet you too…Whether it’s about newsletter feedback or doing business together. And if you’ll be in Bangkok for AWA, check out booth A65. You’ll find The WTAFF Crew there! 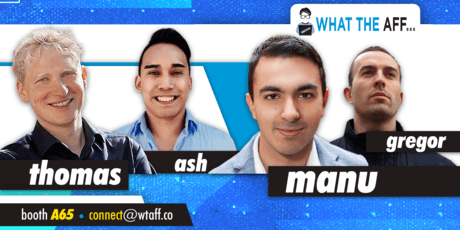 If you want to connect in advance write us: connect@wtaff.co. Looks like it’s time for it to experience another big win, something that could change the heart of crypto trading. And make all the HODL guys and gals happy! Nasdaq, the big American stock exchange, has decided to launch Bitcoin futures. Not sure yet if this is exciting or just another bummer. Bloomberg reports this could happen as early as Q1 of the coming year. As of now, they are in talks with the Commodity Futures Trading Commission to work on the best possible regulations. It’s Nasdaq’s 1st attempt at it, however, Goldman Sachs is already a bit ahead in the futures contract market, when the bank decided to enter the crypto trading in October. The difference is Goldman’s is a derivative and not a real futures contract, allowing Nasdaq more to play with, as it allows for BTC to be traded on a stock exchange. This means it might open up a range of investors, and is not just for a select few which is how it is in Goldman’s case. As per the experts, this might be the signs something might actually be coming… besides the winter!